As bandwidth requirements of users in passive optical networks continue to increase rapidly, especially due to the growth of video-streaming traffic, the need to resolve bandwidth contention among competing users and applications becomes more compelling. To address this problem, we propose application-aware software-defined Ethernet passive optical network (EPON) architecture. It utilizes application-level feedback from the client side (for video users) to the network, through a software-defined network controller, to achieve better client- and service-level differentiation in the downstream direction of an EPON access network. We adopt adaptive video streaming that utilizes feedbacks regarding network congestion for improving Quality of Experience (QoE) of video-streaming clients. 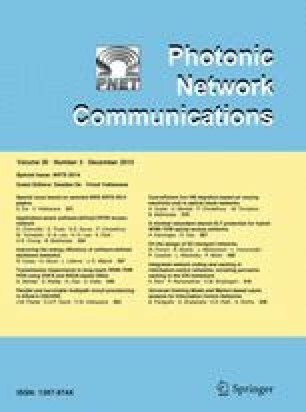 Numerical results for video-streaming applications demonstrate that the proposed architecture for downstream resource allocation considerably reduces video stalls, increases video buffer levels, and also reduces video-switching rate, leading to better QoE for users as a result of better client- and service-level differentiation. This work was supported by ICT R&D program of MSIP//IITP [14-000-05-001, Smart Networking Core Technology Development].